I can count on one hand the number of times I've made a piece of clothing in one day. A simple elastic-band skirt. A night-shirt from a pattern I've used before. That might be all! For me, sewing takes time, and since I'm a perfectionist, the extra time I spend on each step adds up and sometimes keeps me from making everything that I want. So I thought I would break down the steps and see how I can manage things better. In this blog post I'm only going to cover the first few steps. Hopefully I'll come back and finish this topic! I spend a lot of time on this, perhaps too much. I don't like to waste my fabric (or time) making things that I won't or can't wear, even if by doing so I will learn something. I guess it's the engineer in me - I prefer expected results or very carefully thought out plans as opposed to experimenting or throwing caution to the wind. That's also why I don't like to cook (though I like baking because the recipes are usually more exact and the outcome more precise). Many of the things I want to make never get beyond this step because I have "sewing anxiety." My head is filled with ideas, and I can't focus on one thing to make without another potential project creeping in (ooh, new shiny thing!). My fabrics were acquired with projects in mind, not specific patterns necessarily, but types of garments - "this would make a great jacket" sort of thing. So when I see my fabric, I see unfulfilled projects, not raw materials. 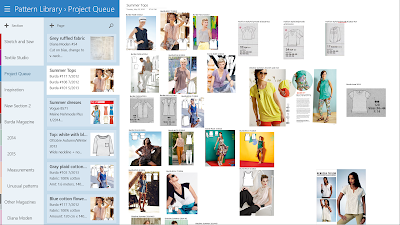 It also doesn't help that I am constantly acquiring new patterns every month - thank you Burda, Ottobre, Sabrina, Meine Nahmode, Knipmode and of course Vogue, McCalls, Butterick, etc. So in an attempt to control this anxiety, I started a project board. I don't have room for a physical design board in my sewing space like designers have with clippings from magazines, scraps of fabric, and sketches. So instead I'm using my tablet computer. 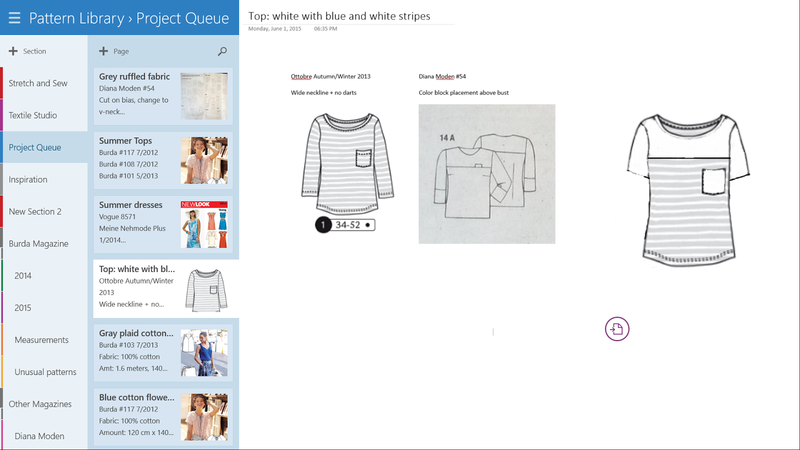 You may recall that I'm using OneNote to store all of my patterns, so I simply made a new section as my Project Queue and filled it with my ideas. 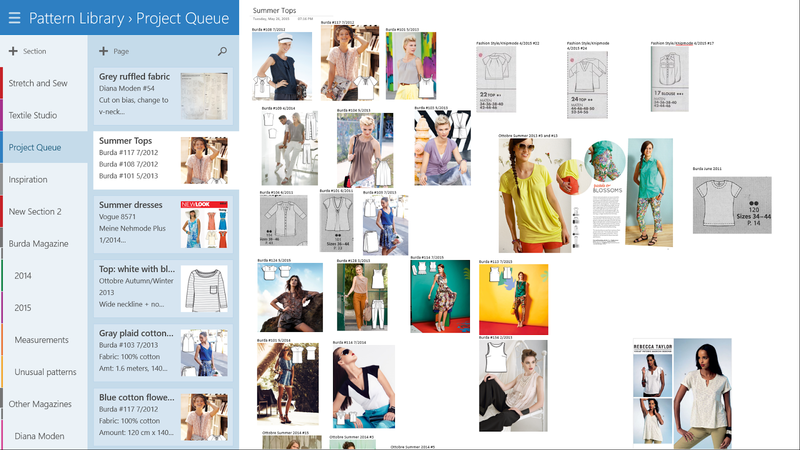 For example, I made one page for "summer tops" that I filled with clippings of pattern photos. Since most of my patterns are from pattern magazines, this is a huge help to have a place where I can put the information about the specific patterns I like and might actually make. 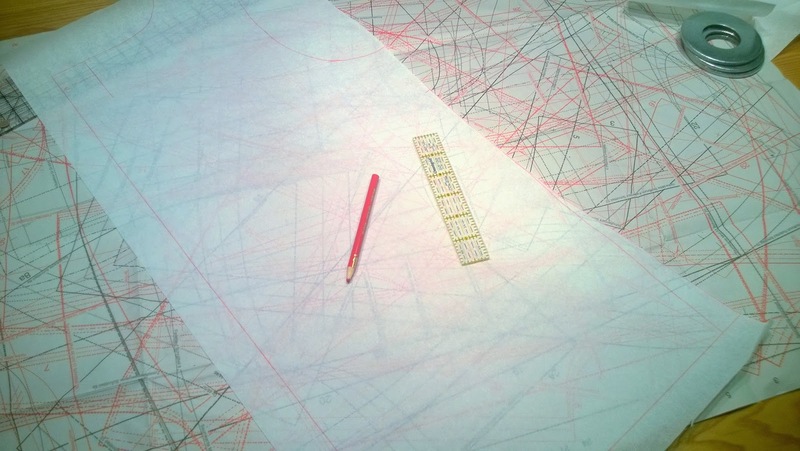 In the past I would lose hours of time flipping through the magazines (or my big notebook of Burda line drawings) trying to find some pattern I vaguely remember. Post-it tabs helped a little, but just left my magazines with lots of colorful little tabs and I still had to go back through them, even if I wrote notes on the tabs. 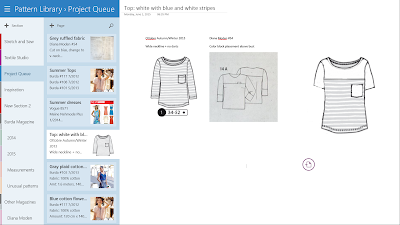 After I finish a project, I move the page to another section I have for completed projects. I've only recently been using my Project Queue (I think I might rename it to Project Board) but I think it's really helping me. I wanted to sew some summer tops and already had the fabric (Step 2) but only had an idea of the kind of top I wanted. I couldn't decide exactly what pattern would be the best for each fabric. Finding and putting the pictures on my Project Board helped tremendously to narrow down my choices and most importantly, remember which magazine the pattern was from. I always tend to buy fabric with only a vague idea in mind, e.g., summer top. Sometimes I have a more specific design in mind but even if I do I often change my mind once I have the fabric home and I look at it some more or I find a different pattern that I think would work better. With my current "summer top" project, I decided to use four pieces of fabric, so I matched them to four patterns from my Project Board and made a page for each top. Last night and today I traced off the four patterns for the summer tops that I want to make. I decided to do them all at once and took over the dining room table to do so. The crazy mess of magazine patterns! Seam allowances are included on this one. I didn't do anything different in this step than I normally do. I use tissue paper (from Nancy's Notions) and colored pencils and make sure I label each piece with all the info, including the size. I always use paper scissors to cut out the pattern first because I don't want to dull my fabric scissors or rotary cutter and I think it's more accurate. Also, it makes tissue fitting easier. Until I use them the first time, I keep the patterns flat and held together with a binder clip. Afterward I'll fold them and store them in bags or envelopes. I'm running low on the plastic pattern-keeper bags that Nancy's Notions used to sell. I really liked those because they were the same size as the Big4 patterns and had a sleeve for the a paper printout of the pattern picture or instructions. I just bought an expanding 7-section file that I think will work well for storing some patterns, well seven of them at least. These summer tops I'm making are really simple and loose so I don't plan to make muslins, though I will tissue fit to be sure. I did measure the patterns first to determine the finished size in the bust before choosing which size to make. In one case I went down a size because it looked like it would run large, and reviews on Patternreview confirmed this as well. I didn't do any FBAs since none of the tops is fitted, but I did add extra width in the hips. This is why I love sewing! In RTW if a top fits in my shoulders and bust it almost never fits across my hips. And if I put in too much ease, it's a simple fix to take it in. But on the subject of muslins and alterations...fitting is definitely one of my obstacles. Sometimes even before I get past Step 1. It's the reason I haven't made fitted pants or something tailored or anything out of really expensive fabric. I've made muslins and sometimes they've helped. Though sometimes I get bogged down in the fitting and never get beyond the muslin. Sometimes I make the muslin and it fits but for some reason the final garment doesn't. Usually it's because the muslin doesn't have the same hand, drape, or give as the fashion fabric. I've used cheap knits to test knit patterns but when the cheap knit had lousy recovery it couldn't mimic the stretch of the "good" knit I wanted to use, so the muslin wasn't a good gauge for fit. So how do I get past the fitting demons? Practice, I'm afraid. When I do have a project that needs fitting, I should try not to rush it. 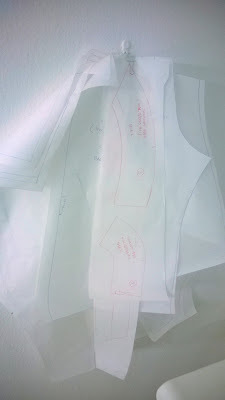 I should use similar fabric to make the muslin(s), and I should not overwork the fitting. I've seen some sewing bloggers agonize over every wrinkle and pucker and make muslin after muslin in an attempt to get the perfect fit. Exhausting! And probably not necessary. I'm not to this step yet with the summer tops. I just finished tracing the patterns. I think I will probably cut out all four patterns one after the other so that I don't have any excuses not to make all four tops (this summer, this year, while it is still hot out and before the snow flies).